We are very excited to announce Auth0 (AuthZero). Auth0 is identity management that "just works". It's about removing the pain of developing, deploying, troubleshooting and operating a modern, advanced identity management system. 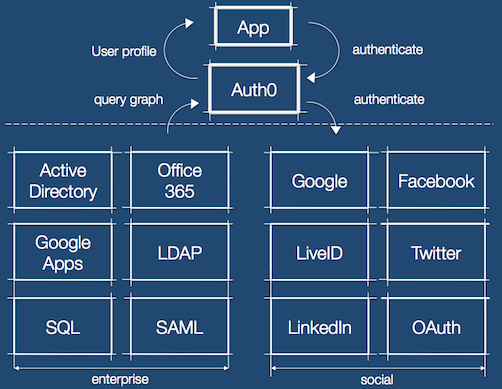 Auth0 allows developers to easily connect their apps with common enterprise identity providers: Office365, Google Apps, Active Directory, OpenLDAP, SQL databases; and social/consumer ones: LiveID, Google, Twitter, FB, etc. We offer automated on-boarding and setup, single-sign-on, a uniform and simple to use API for querying user directories, and logging and auditing. Auth0 is offered as a service, but supports multi-modal deployments: runs in the public cloud, in a private cloud controlled by Auth0, or in a private cloud (AWS only) controlled by the customer.